Geneva, Switzerland. 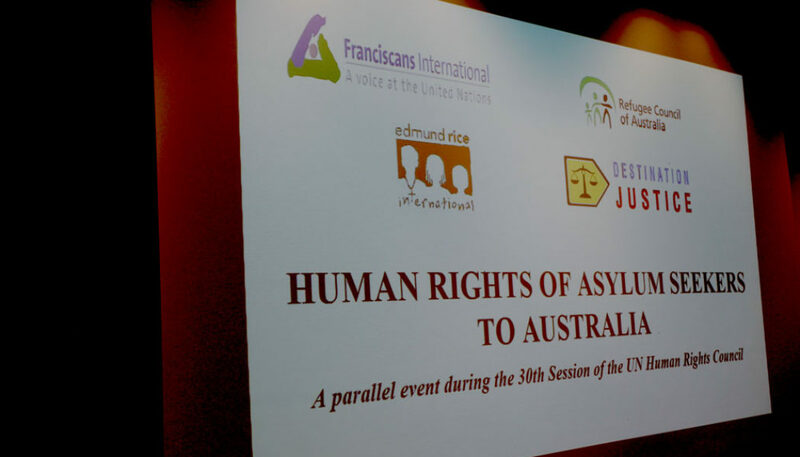 Destination Justice together with Franciscans International and Edmund Rice International presented a side-event on the “Human Rights of Asylum Seekers to Australia” during the 30th session of the UN Human Rights Council, on 15 September 2015. The event was well attended and attracted the attention of a number of Permanent Missions including Australia, Canada, Germany, Indonesia, Russia and the UK who sent representatives. Phil Glendenning, Director of the Edmund Rice Centre in Sydney and President of the Refugee Council of Australia addressed the meeting via Skype and was able to give the audience an insight into the Australian policy relating to the processing and detention of asylum seekers. He noted the emphasis on deterrence, rather than protection and human rights of people as driving the policy. He also reminded the audience that despite being demonised as ‘illegal’ by the Australian government these people were innocent of any wrong-doing and were exercising a fundamental right set out in the Universal Declaration of Human Rights. Carol Hucker, a former case worker and counsellor gave personal testimony to events and human rights abuses she had witnessed while working on both Manus and Christmas Islands. Carol told harrowing stories of the detainees she had met and described the conditions they experienced, highlighting the inedible food, sub-standard accommodation, inadequate medical care, loss of personal property and violence perpetrated by staff – with apparent impunity. Beyond these physical considerations however, Carol highlighted the loss of hope and personal dignity (detainees are addressed by a number rather than their names), the anxiety brought about through the indefinite nature of the detention. In her presentation, Rachel Ball from the Human Rights Law Centre in Melbourne, cited the many instances in which the Australian policy regarding the processing of asylum seekers has been criticised by the UN for failing to meet international human rights standards and detailed how the Australian legislation violates international law. She also highlighted the need for Australia to demand greater accountability for the respect for human rights on the part of the private businesses contracted to operate the detention centres. All speakers drew attention to the detention of children, with its adverse effect on their access to education and their mental health (one 6 year old had attempted suicide). The response of the Australian government that “the best interest of the child is outweighed by other policy considerations” was noted with concern. In response the Australian government representative declined to comment on specific issues raised, but stressed the willingness of the Australian government to continue to engage with civil society in order to listen to concerns and work to improve the situation in the detention centres. A number of common recommendations were put forward by the speakers; among them, Australia was recommended to repeal mandatory detention and children detention provisions and to ensure that migrants’ protection claims are properly assessed and independently monitored.